This is one of the more established rex cats. The Cornish Rex is the other established rex cat. It has that well known pixie face, a modified wedge shaped head and wide, prominent cheek bones above which are large ears. They are quite small and lightweight at least to the eye. In cat fancy terminology its body conformation is a “semi-foreign type” (slenderish)2. There are a number of rex cat breeds. There have been many instances of the occurrence of curly haired cats popping up all over the world. Click on this link (new window – LaPerm cats & list of Rex cats) to read about some of the rex cats that have been noticed in the world. They still do occur, I am sure. Some die out, some make it to become a recognized and registered cat breed. One such cat is the Devon Rex. Click on the link to read about curly cat coats. 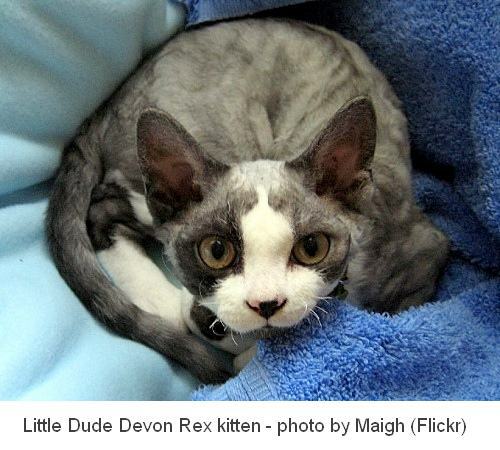 The Devon Rex cat was discovered by Miss Cox in Buckfastleigh, Devon, UK in 1960 as a feral/stray kitten. She called the cat “Kirlee” after the curled hair. Kirlee is the founding cat. The genetic mutation causing the curly hair is recessive (the gene is indicated by the letters “re”). The breed is not related to the Cornish Rex, whose coat is also due to a recessive gene (“r”). It is a rare and little known breed. Other Rex cats are the Selkirk Rex and the LaPerm. You can read a bit about the Tennessee Rex as well (this is a submission by a visitor to this site). The Devon has a substantial amount of Cornish Rex ancestry due to the early development in the UK of using the compatible Cornish Rex lines. 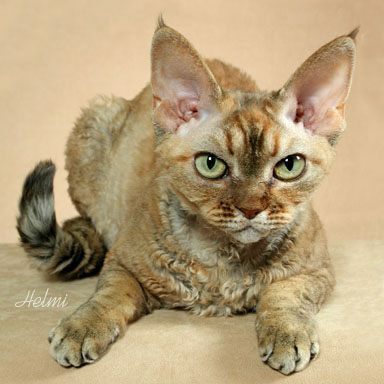 1959 Kirlee born amongst non-pedigree cats in September, the first formally recognized Devon Rex cat. 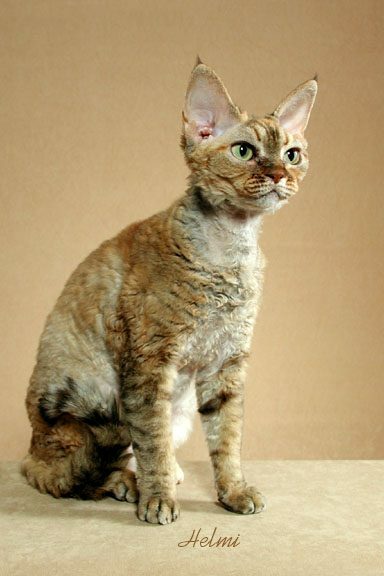 This breed was “discovered” in 1960 when the person who adopted Kirlee spoke with a Cornish Rex breeder. Kirlee was born to a tortoiseshell and white feral cat. 1961 Discovered that the gene responsible for Kirlee’s curly coat was not the same as the gene responsible for the Cornish Rex coat. 1960s Early development of this breed involved discovering that the gene was recessive and eventually Kirlee was mated with a British Shorthair and the offspring of that mating bred back to Kirlee. This resulted in 50% rex coated kittens establishing the recessive gene and a different gene to the one producing the Cornish Rex coat. 74-80 Further importation into USA takes place over this period mainly from the UK and also from New Zealand. On one occasion a British breeder emigrated to the USA and brought all (more than 12) of her Devons with her. 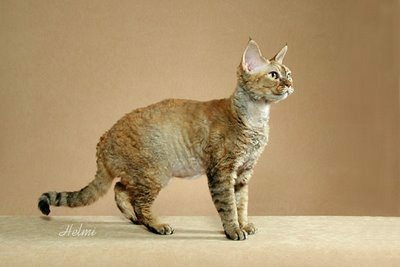 1972 ACFA first cat association in the USA to recognize this breed as separate (from the Cornish Rex which was established already). 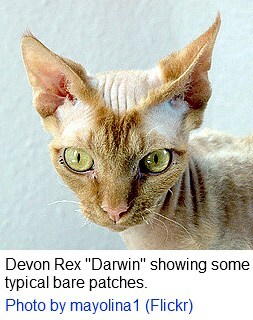 This pleased Devon breeders as the Devon is really a different cat, carrying a different mutated gene to the Cornish Rex. Devon breeder sought separate recognition. 1979 CFA recognize the Devon Rex as separate breed. 1983 CFA grant Championship status, the last cat association to do so. The picture above gives a nice idea of what the coat looks like. They are of medium size (average six to nine pounds), but lightly built, which when combined with their long strong rear legs enables them to jump athletically. They are on the light side of average, in fact, with respect to cat weight. Their pixie like face and large (very large when compared to the small face) ears give her the nickname “pixie cat” or “alien cat”. There is a hint of the pixie about their appearance. They have noticeably long and slender necks. My first impression on seeing a Devon Rex was how fragile and delicate they are. The best known pointed cats are the Siamese and the Himalayan. The coat can range from “suede” to “mop”. The Rex Cat Club says that they have long toes. I can relate to this as the Sphynx has long toes too. Sphynx cats use their toes like hands and they behave a bit like monkeys sometimes climbing things. The coat is very low maintenance as it is so thin. One breeder says you can groom a Devon Rex by stroking her. The CFA says this cat is “wash and wear”. A quick wipe down will suffice apparently. Like all normal domestic cats the Devon Rex cat is people orientated – more than that, “enjoy being around people”2. It is also mischievous and playful. It is said to be “easy going and delightful to be with”2. They are also said to like shiny objects; taking coins and jewelry and playing with it. I have not heard that before in a cat breed. They sometimes hide their “treasure”. This cat is a good jumper and intelligent and therefore can be trained to a certain extent. It is said that this cat breed has some of the characteristics of a monkey (climbing) and a dog (training). This cat breed is not listed in the intelligence charts due to rarity but it has similarities to the Sphynx cat, which is perhaps the most intelligent domestic cat breed. Being particularly people orientated they show a lot of affection. They like to snuggle up to their human partner apparently preferring to be high up on the person around the neck. This may naturally happen at night in bed. This behavior may in part be due to heat loss because of the thin coat. It is sensible to clean their large ears regularly. Kittens may lose their coat at six weeks of age and it may take 2 years to grow back if at all. They have good to excellent appetites probably because of heat loss which translates to a loss of energy requiring food to top it up. This means that they like their food. It is claimed that the Devon Rex cat is hypoallergenic meaning causing fewer or weaker allergic reaction to people who have an allergy to cats. This is untrue as an allergy to cats is caused by the cat allergen Fel D1. It is said that the Devon Rex is a low shedding cat breed (opens in new window), however, which apparently minimizes the effects of an allergy to cats. The Allerca cat is claimed to be hypoallergenic by the company LifeStyle Pets. There is some commonsense behind this as the Ashera GD (the largest of the Lifestyle Pets cats) is in fact a Savannah cat and Savannah cats are semi-hypoallergenic. The Siberian cat is also thought by some to be hypoallergenic. There is no science behind this as far as I am aware but the article on hypoallergenic cat breeds covers this point. Cats have three types of cat hair: guard hair, awn hair, and down hair. It is said that the Devon Rex has no guard hair. Yet, Robinson’s Genetics 4th edition, states at page 178, that “the Devon Rex coat possesses guard hairs but tends to have a thinner coat and is more prone to bare areas especially on the chest and stomach”. Linda P. Case in The Cat, Its Behavior, Nutrition & Health says at page 27, that it has “very few guard hairs”. The coat density and the cat’s ability to keep it during molting should be controlled through good breeding. The coat is sparse, curly, very soft, with low shedding. The combination means that this breed, although not hypoallergenic, is perhaps more suited to people who suffer from cat allergies. Because the coat is thin the cat feels hotter than expected. Update 14th Sept. 2010: The recessive gene (re) produces the crinkly sparse coat. The whiskers are short and bent like those of the Sphynx cat. There is a similarity between the Sphynx and Devon Rex cat. This has led to some breeders to cross the Sphynx with Devon Rex. This is allowed under the TICA Sphynx breed standard. The recessive gene (hr) that produces the downy coat of the Sphynx is dominant to the re gene. Sometimes, rarely, in breeding Sphynx cats with Sphynx parents, a Devon Rex will unexpectedly pop up. 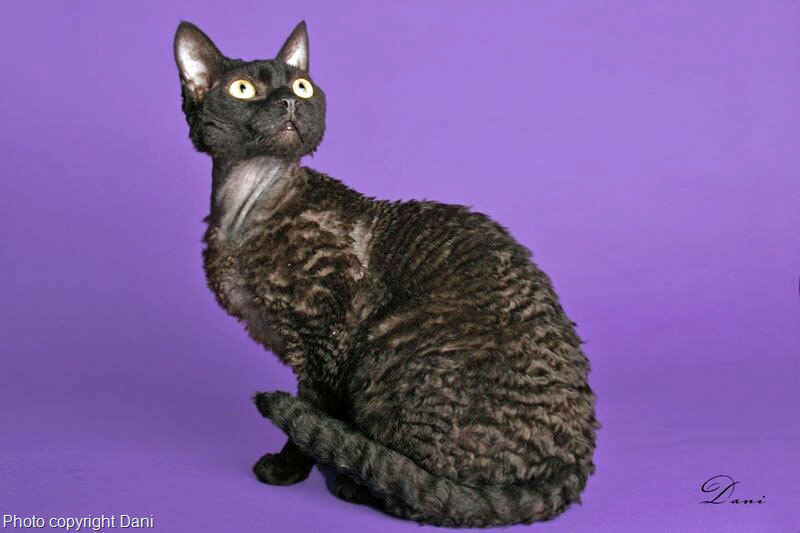 Rarely (but a possibility) the Devon Rex (and the Cornish Rex) will suffer complete hair loss at 6 months of age due to defective hair follicles (Hypotrichosis). The Devon Rex cat can suffer from some genetic diseases some of which also affect other purebred cats. This is a full list: – see Devon Rex health for more on this. Breeders do outcross to widen the gene pool to gradually eliminate these genetic diseases. DEVON REX CAT AND ALLERGIES The cause of the allergies are the fur and the saliva/dandruff of the cat. The Sphynx cat is one of the best for people with cat allergy because all they have is a kind of fuzz for hair. Although they are not hypoallergenic – no cat is. DEVON REX CAT PERSONALITY Remember there is “breed personality” and “individual personality“. The latter can outweigh and be more important than the former. Just as for humans individual cats may buck the trend for that particular species or at least be off target for that breed in respect of character. DEVON REX KITTEN HAIR It seems that some kittens are almost bald except for hair on the extremities. The hair gradually grows with the kitten. If the kitten appears well and is like this it is probable that the hair will grow to cover the body in due course. DEVON REX INDOOR CAT AND ALONE Bearing in mind that this breed is social and active it would seem to be inappropriate to leave him/her in a home all day alone. But, one solution might be to adopt two adults from the same shelter if possible to keep each other company. Rex Kitten from Sphynx Breeding? This entry was posted in Cat Breeds, Devon Rex and tagged devon rex, Devon Rex Cat by Michael Broad. Bookmark the permalink.